Connections of Prince Of Sussex after winning the VOBIS Gold Rush at Bendigo, 30/3/19 (Racing Photos). Prince Of Sussex, a brilliant first-crop representative of Swettenham’s resident stallion Toronado, showed his raw talent at Bendigo when he demolished his rivals in the highly competitive $280,000 VOBIS Gold Rush over 1000 metres. Mornington based trainer Matt Laurie was elated to see the two-year-old show his true worth and said he will now focus on the $1 million Showdown for the progeny of VOBIS Sires nominated stallions, to be run for the first time at Caulfield on April 27. 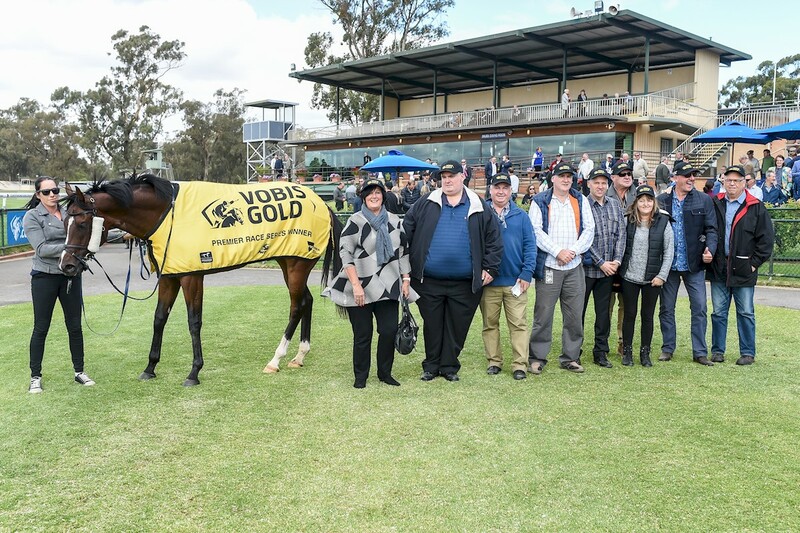 The Showdown and the VOBIS Gold Rush, are two of eighteen races in the VOBIS Gold Premier Race series, which boasts an incredible $4.45 million dollars across the series. The series is targeted by trainers due to the exceptional amount of prizemoney on offer. Strongly supported by Racing Victoria and the Victorian State government and with MP Maree Edwards, the State Member for Bendigo West in attendance on Saturday, Bendigo was abuzz with excitement. The son of the popular Victorian sire under Michael Dee won comfortably being eased down by two and a quarter lengths from The Executioner with the Fighting Sun colt Groot a length back in third. Prince Of Sussex was the number one draft pick for Laurie and long-time stable client Paul Dugan as Carringbush Park at the 2018 Inglis Melbourne Premier Sale from Swettenham Stud’s consignment for $145,000. “Paul has been with me for years, and he made a short list of lot numbers. We liked this bloke the best on type,” Laurie said. Swettenham’s Sam Matthews was over the moon with how he gave the rest of the field a galloping lesson and is excited to have a strong representative of Toronado in the Showdown. “He will likely start favourite after his VOBIS Gold Rush win, and it was great to see Prince of Sussex validate the huge opinion Matt Laurie had of him. We couldn’t have been more impressed. We always knew it was there, and we look forward to more performances of that quality to come.” Matthews said. Prince Of Sussex is the second foal of the Testa Rossa mare Il Diamante, who showed ability in her four starts for Peter Moody winning on debut at Cranbourne and placing at Sandown and Sale before finishing her career on the track with a fourth at Sandown. Il Diamante is a half-sister to the multiple stakes-placed Montauk (More Than Ready) out of the well-performed Octagonal mare Diamond Cove a Listed stakes-winner of seven races from the family of Charge Forward and Kidman’s Cove. Her three-year-old Equiano filly, the speedy Algadon Miss, also trained by Matt Laurie has won her last three starts in succession, including two at the Valley, and looks to be very promising. “He was one of the highlights of the draft last year, and the mare resides with us, as his breeder Chris, is a long-time client of the farm,” Matthews said. Breeder Chris Jackson is naturally cheerful about the commercial pedigrees updates his mare has recently received. “It’s been an incredible few weeks for Il Diamante with her first foal, also with Matt Laurie unbeaten since joining his stable, including winning a 55 second challenge at The Valley and a 1000 metre BM 78 by 1.5 lengths. She sure can throw a top-class sprinter and her weanling filly by Toronado looks to be in the exact same mould,” Jackson said. Matthew’s reports that Toronado’s 2019 book is filling fast with around 70 mares already on the list, and a with handful of runners coming up over the next couple of weeks, “he could provide breeders with more winners, hopefully of the quality of Prince of Sussex,” Matthews said. While another recent brilliant result for Toronado was the win of Heaven’s Bonus in the Tasmanian Sires Produce over 1400 metres in Launceston. From the mare Heaven’s Choice, bred by his owners David and Louise Adams, they have been fortunate to have already tasted success with the broodmare Heaven’s Choice, who produced Heaven’s Delight to win the 2017 2YO Tasmanian Magic Millions Classic. “That’s two on the trot for Heaven’s Bonus, and he had also placed in the 2YO Magic Millions. He will now have a break, but more than likely he will cross the Bass Straight to the mainland and be very competitive in the spring,” Matthews said. “It is great to see that breeders to Toronado in the second year were rewarded at the sales, and that breeders to him in his fourth year are now being rewarded with these quality gallopers hitting the track in style,” Matthews said.